Come learn about the direction of the broader Episcopal Church on Sunday, July 15 at 11:30 in the Davis Room, where participants from the General Convention will share their experiences. Caroline Christie served as a deputy, and John Mennell and Diana Wilcox participated in other ways. 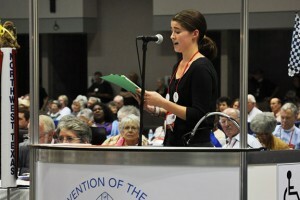 The three will discuss the basic structure and purpose of the convention and some of the many resolutions that were passed and what impact (if any) it will have on us at St. Luke’s. For more information contact John Mennell.